On the evening of Thursday 17 May 2018, just over a week from the date of this post I, Caroline Lawrence, will be meeting with children aged 8-12 (and their guardians) at an ancient Roman underground temple: London’s Mithraeum. 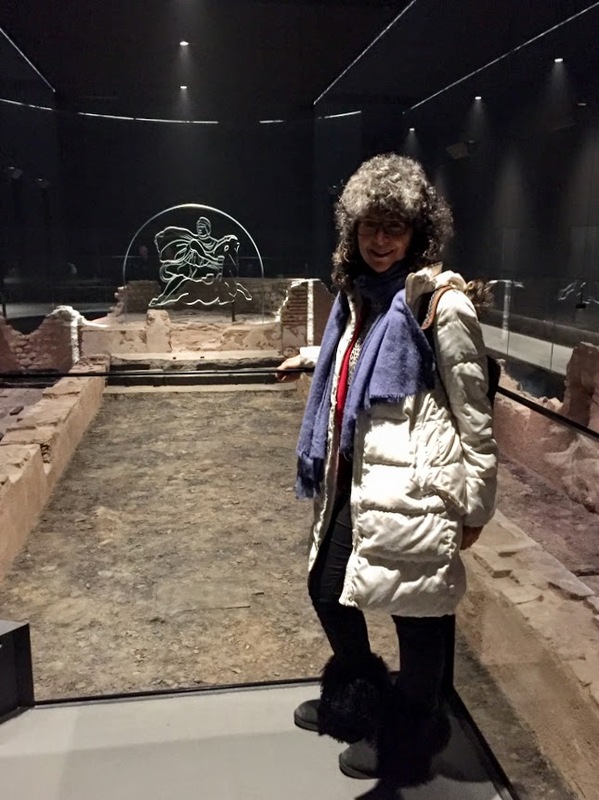 This will be the first #MuseumsAtNight hosted by the Mithraeum at Bloomberg Space, which only opened to the public last year. 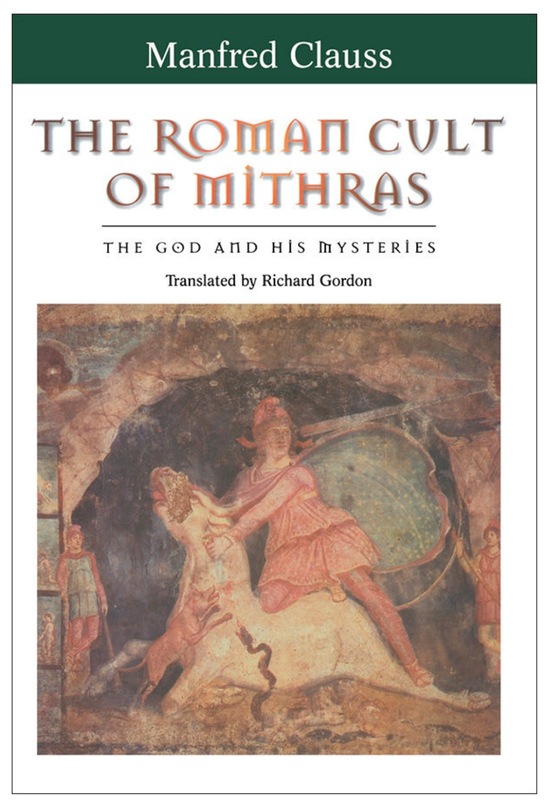 Mithraism was a mystery cult that arose in Rome (or possibly the coast of Turkey) in the middle of the first century AD, around the same time as Christianity. 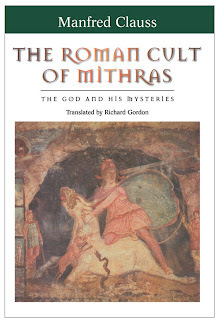 Unlike Christianity, Mithraism was a mystery cult and by definition kept its rites and rituals secret. There were no scriptures so almost everything we know about it is guesswork based on archaeological evidence and a few peripheral literary sources, some of them hostile. The god Mithras seems to have had elements of the Indo-Iranian god Mithra (without an S), but with added qualities from other deities. Like Serapis and Sulis Minerva, he was syncretistic, i.e. a hybrid god, one to be added to hundreds of others. If the symbol of Christianity is the cross, the symbol of Mithras was a very complicated scene of the god stabbing a bull while surrounded by signs of the Zodiac and other heavenly figures, including two torchbearers called Cautes and Cautopates, possible threshold guardians to the Gates of Heaven. Also crowded into the scene were creatures such as a dog, a snake, a raven and a scorpion. Trying to reconstruct the rites, rituals and beliefs of Mithras based on this mysterious image would be like someone trying to reconstruct Christianity based on the image of a crucified man along with accounts of a few of his miracles. Another theory is that the bull represents evil which cannot be destroyed, only disabled, and that the stabbing is an apotropaic attempt to weaken its power and bring some good out of it. 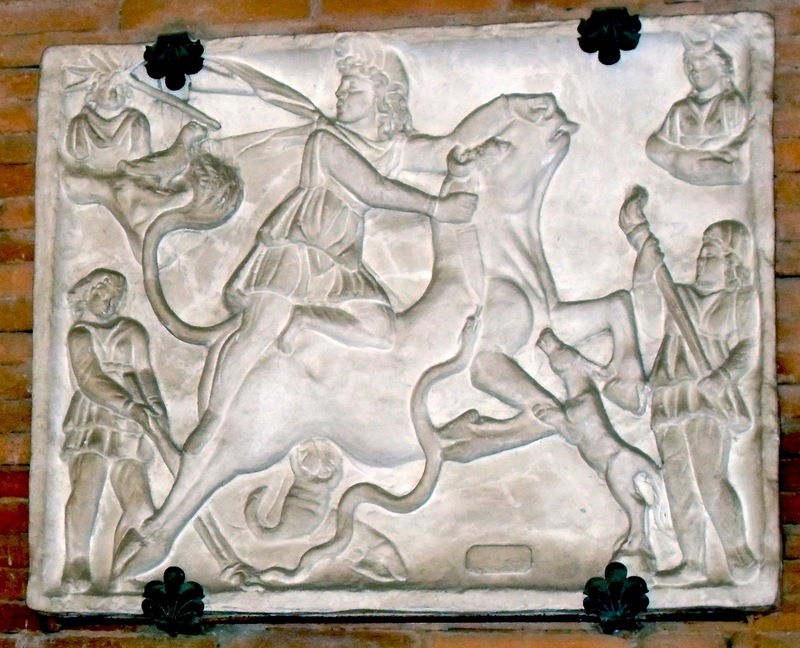 However there are also scenes of Mithras and the sun-god Sol enjoying a banquet on a bull’s skin, so it seems the first theory is more plausible, though the bull-stabbing did also seem to have apotropaic powers. Unlike almost every other religion known to us, Mithraism was only open to men. The small, exclusively male congregations met not in a temple but in an underground space designed to partly resemble a cave. In fact the use of the word ‘mithraeum’ is nowhere attested. Instead we find references to ‘Caves of Mithras’. Another of the aspects we can be fairly sure of is that there was a hierarchy of different grades in this Mystery Cult. The idea of rising by promotion would have been a familiar one to soldiers and male citizens of the Roman Empire. We believe there were seven grades of initiation ranging from Raven to Father. Each grade had its own name, ruling planet, colour, attributes and possibly even noises. The aim of moving from grade to grade was possibly to achieve immortality of the soul by ascending through the seven heavenly spheres of purification or knowledge. A fascinating mosaic showing the grades by attributes can be seen on one of Ostia’s seventeen Mithraea, named after Felicissimus, who dedicated the mosaic. Pictoral evidence hints that each grade could only be achieved by enduring a humiliating and frightening initiation. This often involved the initiate being stripped, blindfolded and threatened with death. 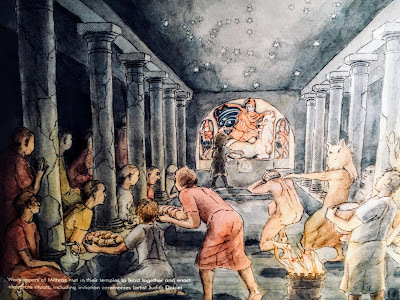 Following the initiation of a new member the followers of Mithras would celebrate a banquet, an important part of the brotherhood as the layout of over four hundred Caves of Mithras show. 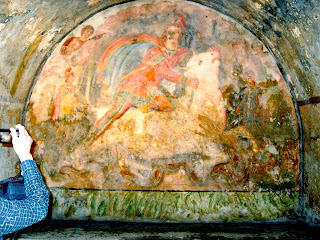 A tantalising find concerning Mithras is a possible liturgy written on the walls of the Santa Prisca Mithraeum at Rome. For those of you who have studied Latin, (children included), I thought it would be fun to publish the Latin liturgy created especially for London’s Mithraeum by Roger Tomlin, the brilliant scholar who has translated many of the Vindolanda and Bloomberg tablets, ancient Roman documents that have defeated mere mortals. 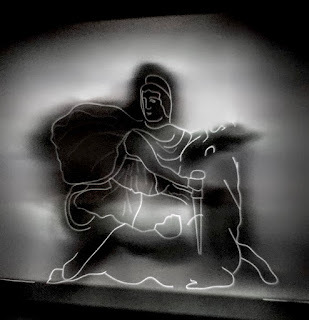 Roger has replicated a possible liturgy based on the graffiti from the Santa Prisca Mithraeum. What follows are Latin phrases that sharp-eared visitors to London’s Mithraeum might ‘overhear’ when they descend to the ancient temple for the Immersive Experience. The one word you might not recognise is Nama. This is the Persian word for ‘Hail!’ and the Sanskrit word for ‘I bow’, still used today by everyone who takes a yoga class when they say, Namaste: ‘I bow to you’ or ‘I thank you’. Hail to the Father, etc. Hail to the Fathers, from east to west [lit. from rising to setting sun], under the protection of Saturn. Roma regit populos, rex tu tamen omnium. Rome is above the Nations, but Thou art over all! And when the lights come on again you are in for a surprise! Roman Mysteries author Caroline Lawrence is currently working on a book involving a 12-year-old Londoner named Alex Papas, a time portal in London’s Mithraeum and the bones of a 14-year-old girl from Africa who died in 3rd century Londinium. The working title is Ways to Die in Londinium. Caroline will be brainstorming ideas and doing a reading from this work in progress at London’s Mithraeum on the evening of Thursday 17 May 2018. Book your FREE place HERE. Thank you for posting this. 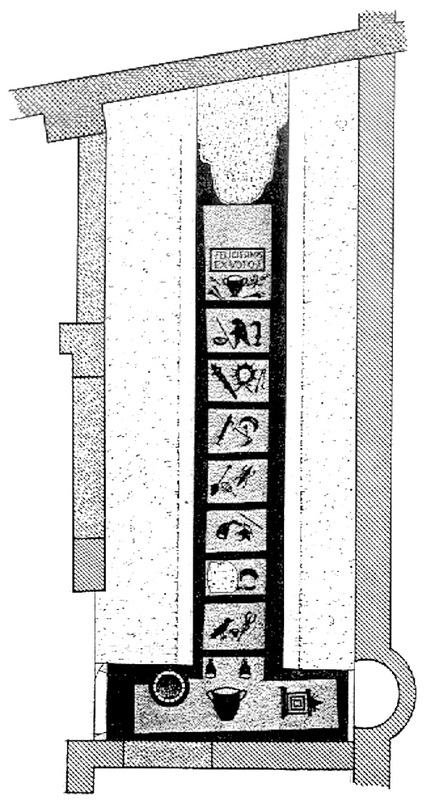 The staff at the London Mithraeum were too tight to let me have a copy of the liturgy.